How many times did you awake this winter to discover that your car was covered in ice and snow because there’s no room for it in the garage? Trudging out in the harsh elements to brush away snow, chip off ice and warm up your car is the last thing you want to do on a busy weekday morning. Worse, it can leave you rushing to get to work or to get the kids to school on time, making winter travel even more dangerous. Last year, perhaps you promised yourself that you wouldn’t spend another winter forced to park your car outside of the garage. The months seemed to fly by, and your plan to organize or renovate the garage never quite happened. Before you knew it, you were in the midst of another harsh winter. After our last blast of wintry weather, perhaps you’ve made the same promise to yourself again this year. Next winter might feel as though it’s a lifetime away. But then again, remember how quickly last year seemed to pass? The first month of the year is already in the books, and Groundhog Day is almost here. Ontarians are eagerly awaiting Wiarton Willie’s prediction of whether spring is on the horizon. Wiarton Willie’s forecast of what’s to come is out of your hands, but the fate of your garage isn’t. Now is the time to start making plans. Think it’s too early to start planning for a garage renovation? It isn’t. 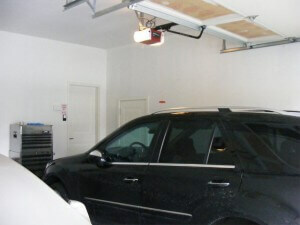 Garage organization and renovation services are in high demand and have been growing in popularity in recent years. Schedule your garage renovation consultation in February to ensure your project will be started as soon as spring arrives. Starting early allows plenty of time for consultation, design and the ordering of products. Safely store your winter tires. Neatly store winter sports equipment like sleds, ice skates and skis. Store family bicycles off the ground and out of the way of vehicles. Neatly house gardening tools and equipment. Just as unprotected sun exposure can damage your skin, it can also damage the paint on your car. Over time, the sun can cause oxidation and premature fading. Prolonged exposure to the oppressive summer sun weakens leather seats and rubberized trim. The headlights of your vehicle are also impacted by exposure to the sun. Parking your car in the garage during summer keeps your vehicle looking newer longer. It also makes it more comfortable to get into the car on hot summer days. Renovating your garage during spring means you’ll have a safe place to park your car next winter, but you’ll also be able to enjoy the benefits of an organized garage during spring, summer and fall. Each garage renovation is tailored to meet the unique needs of the client. So whether you need a simple wall organization system, overhead storage, garage cabinet installation or customized storage solutions, your garage renovation specialist can help your dream garage become a reality. Complete the garage survey form to tell us a little about your garage and schedule your no-cost, in-home consultation.